A. Lecture by Mrs. Eleni Stoumpou-Katsamouri, archaeologist and director, titled “Archaeological Stories on the monitor”. It will be a presentation of the history of the archaeological movies since 1930, from when we have the first video recording of archaeological excavations, until the hypermedia age. B. Screening of the film, titled “THANKS TO MEMORY. A digital tour with high-definition technology”. The movie is a production of the Archaeological Institute of Macedonian and Thracian Studies. It lasts 15 minutes and 26 seconds, has English subtitles, and is the product of the cooperation of the Museum of Byzantine Culture with the Archaeological Institute of Macedonian and Thracian Studies. It was created for the celebration of the International Museum Day 2012 and deals with the painting of the funerary monuments of the permanent exhibition of the Museum (Gallery 3). It is a pioneering production, which, based on high-definition technology, highlights the iconography, the subjects, art and technique, aesthetic values ​​and symbolism of a particularly important set of funerary mural paintings, dated from the 3rd to the 6th century. Direction, recording and image editing: Eleni Stoumpou - Katsamouri, Archaeologist and director. 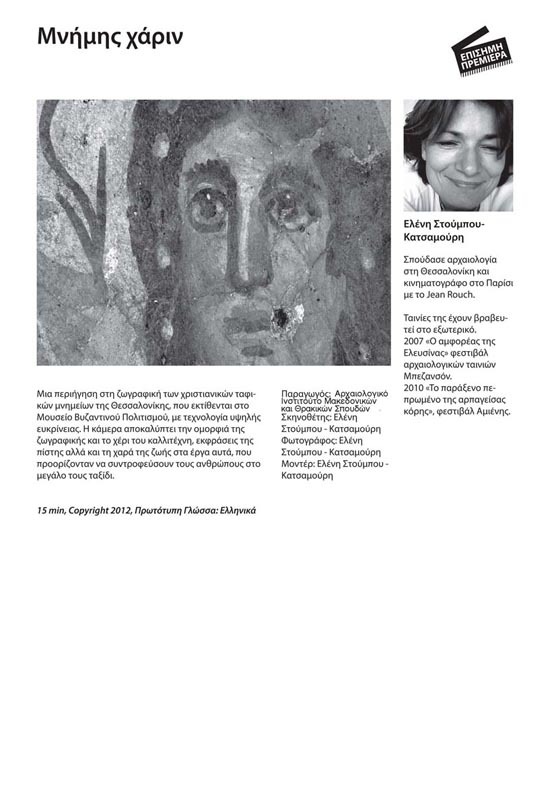 Scientific editing, texts, narrative: Dr Agathoniki Tsilipakou, Director of the Museum of Byzantine Culture.